Every season has its appeal. Smart home stagers know that tapping into buyers' "mood of the season" can go a long way towards capturing the hearts of buyers. If you're planning on putting your house on the market this fall, you'll increase your chances of a quicker sale if your home is staged for autumn. You don't have to make major purchases or spend a crazy amount of time staging just for autumn. A few simple changes are all it takes. Most people think of fall as a warm and cozy time of year. Not every area of the country experiences the changing colors of autumn leaves, but these same colors still make a home feel comfortable, friendly and secure. Adding autumn color is easy. Look for props you have or can buy or paint that reflect the colors of changing foliage and embers -- reds, oranges and golden browns. You can place these decor touches near your front door or walkway. Real and faux pumpkins and gourds are for sale everywhere at all price points. An autumn wreath of corn husks or grapevines, or a basket of painted pinecones or real pansies outside your entrance will welcome people on a home tour. Inside your home, adding some accent pillows or throws in warm colors might be all you need. In case your interior color scheme is based on a cool color palette, the safe way to incorporate warm tones is with creamy whites or dark browns, since both are safe neutrals. In addition, every home decor site and store has autumn-themed accessories like pillows, candles, table runners, garlands, and the like. Don't lose your head; a little "Welcome Autumn" goes a long way. Another sensible and thrifty approach is to use a floral arrangement with seasonal elements. It needn't be fresh flowers. Silk chrysanthemums or good quality faux autumn leaves and berries will set the tone. Almost anything woodsy or harvest-themed is also fair game. Your goal is to capture that snugly feeling most people think of when they think of the end of summer and the coming holidays. Using rich textures is also a way to evoke that emotion. Any rooms that feel less than cozy can benefit from things like a fuzzy blanket, velvet pillows, a furry ottoman, or a knitted throw. Some rooms of your house may look less seasonal than others. A dark and dank basement can feel especially unwelcoming. While a full-on basement remodel can offer up to a 70% ROI, there are simpler ways to make this area and other weak spots become part of your strategy to impress buyers. Light paint colors will make dark areas feel more homey. Using the typical colors of fall and some seasonal decorations like a centerpiece or mantel display, you can make your home feel like the perfect place to snuggle up under a blanket during the fall. 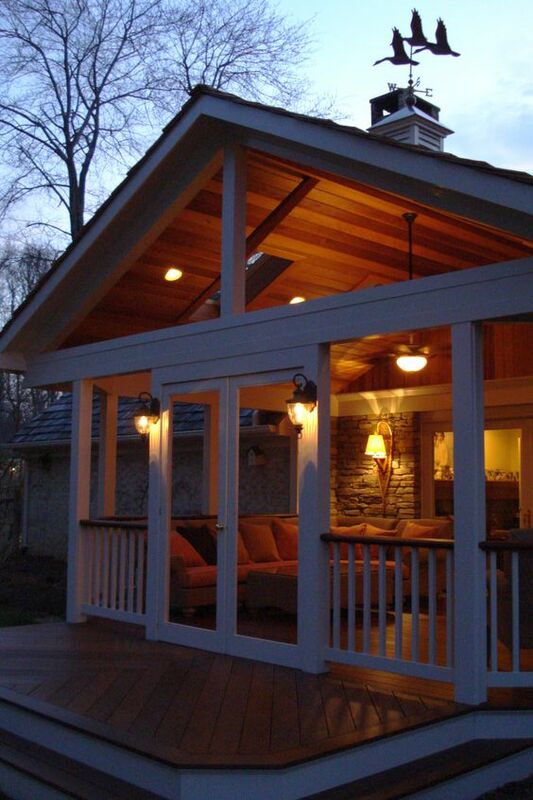 Nighttime curb appeal: Interior lighting at night creates a sense of retreat. Photo: Archadeck of Raleigh-Durham and the Greater Triangle. Twilight comes earlier and earlier at this time of year. Shorter days lessen the chance for house hunters to see your home flooded with natural light. Make sure you are taking advantage of all natural and artificial light sources your home offers. Check your lamps and fixtures for burned out bulbs. You should have plenty of lamps, overhead lights, and mirrors spread throughout your home. Leave lamps on or plugged into timers when you expect a showing, especially in darker rooms. Not every Realtor will have time to do this for you. Light and bright sells homes. Switch on exterior lighting at dusk because some home shoppers will cruise neighborhoods at different times. Timers and solar lights make outdoor lighting easy and economical. If you can manage it, schedule open houses and showings during the sunniest times of the day so potential buyers get a good look at the entire home, both inside and outside. There are Halloween decorations and there are autumn decorations. I know that for some people, Halloween is their anticipated time to drape whispery white cobwebs over resin gravestones and skeletons in the front yard. Don't do that if you are selling your home. Stay with the simple harvest and autumn themes. Too much seasonal decor can be distracting and not to everyone's taste. Instead, let house hunters focus on the pleasant attributes of your property -- that wide front porch, the functional floor plan, the updated appliances, the fresh paint. 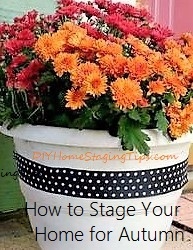 Remember that you are staging, not decorating. Make your home enviable, not tacky or creepy. With the beautiful fall atmosphere, fall can be the perfect time to stage and sell a home. Keep these simple fall home staging tips in mind to ensure your house is as perfect as possible when it's time to sell. And if you're looking for more home staging advice, you can purchase my $4.99 eBooks on how to stage your home.